Applied Reliability Engineering Volume I, 5th Ed. Volume I of the book focuses upon metrics of reliability and methods of achieving reliable components. Copyright © January 2006 by The Center for Reliability Engineering, University of Maryland, College Park, Maryland, USA. 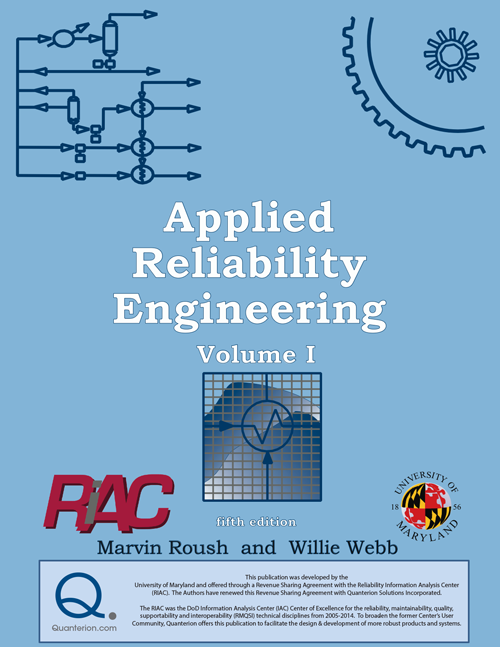 This book is organized to provide an introduction to reliability engineering, both for practicing engineers and for students. The emphasis throughout is on concepts and basic principles. It contains practical applications to guide the reader to appreciate the value of each topic presented. This book was not developed to be used as a handbook or reference book; such books commonly are made up of a number of self-contained modules that provide information about separate topics. Rather, this work is a carefully woven fabric of connected ideas that are progressively developed. Handbooks and other ‘how to’ books are meant to meet short term needs for carrying out a given process but do not lead to a full understanding of the subject as is the goal here. More advanced texts are cited for further reading on the mathematical and statistical aspect of reliability analysis and engineering. The approach to engineering described here is one that has been evolving in many companies. They have moved away from an approach that only evaluated product designs through testing and data analysis to one that integrates all parts of the product design and development in a thoroughly integrated reliability program. The activities in such a program are not an end in themselves, but rather, are valuable when utilized to assist in making proper engineering and management decisions. This book is used at the University of Maryland for a two-semester course for both upper-level undergraduate students and graduate students. By selecting the appropriate portions of the material, considerable flexibility is available for using this books as a reference for a one-semester course. The first part of the book focuses upon metrics of reliability and methods of achieving reliable components. The second half focuses upon system reliability, system analysis techniques and unique problems that arise from interactions between distinct parts of a system.